Congratulations on getting the brass coin...you are going to love it! Now I’m going to show you how to get this awesome .999 pure fine silver commemorative pre-RV collector's coin for free! This rare coin is HOT off the presses! The coin images you see here is a photo of the actual coin! 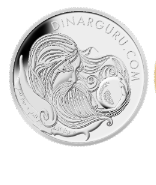 Because you are a dinarguru.com member and as a HUGE thank you, you’re hearing about this before anyone else (OFFER ENDED: ONLY 7 EXTENDED COINS AVAILABLE). 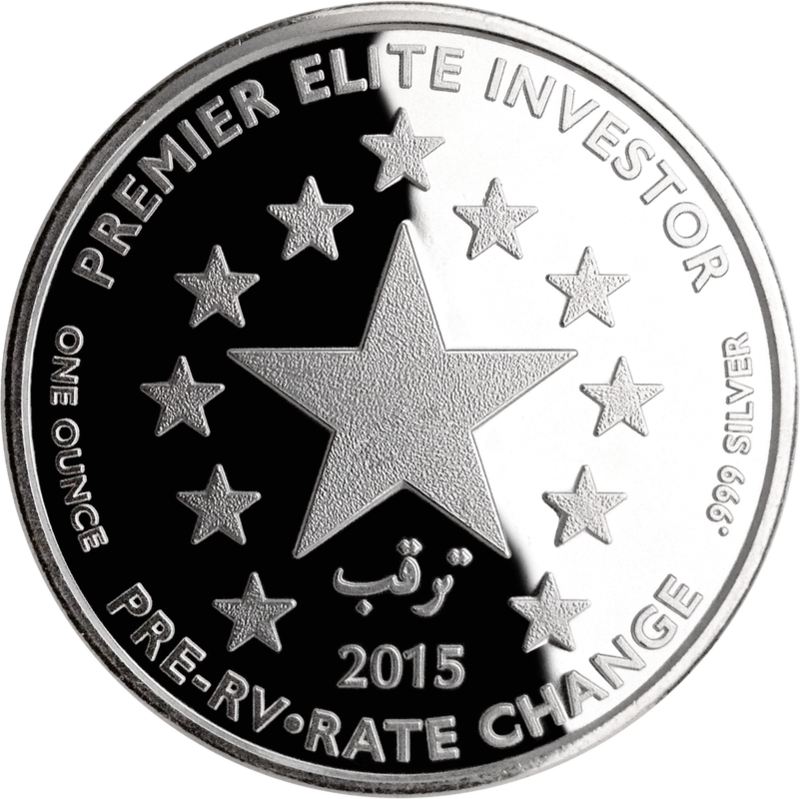 As you can see this coin is BEAUTIFULLY designed…in fact this Premier Elite Investor coin was designed by an award winning, world renown coin designer who has designed currency coinage for countries around the world! This is a fun way to commemorate and remember your dinar experience! Obviously, you take your dinar holdings very seriously...your actions on getting the brass coin prove this. You are an Elite investor and because of this I have something VERY SPECIAL that separates you from the crowd. 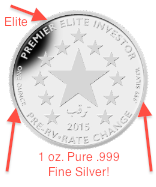 I'm going to give you my Premier Elite Investor Coin Absolutely FREE! Large 39mm coin: about the size of a silver dollar. Made in USA: From design to sculpting to minting…all U.S made. Premier Investor Coin: You are one of the first to invest, so you will be one of the first to own one of these rare collectors items! Commemorative Pre-RV- Rate Change Coin: This is your tangible proof you can hold in your hand and share with friends for years to come, that you knew about the possible RV before most were willing to take the risk! 12 5-pointed stars: 2015 marks the 12th year of the new Iraqi dinar’s existence…represented by 12 raised 5-point stars. Individually Numbered: Each coin is INDIVIDUALLY etch numbered starting with coin #1. You now have the brass coin and it's great, but I want you to complete your coin set and give you the Premier ELITE Investor coin absolutely free. This coin is an investor's dream. It's a 1 once 39mm .999 fine silver coin valued at $97...and yours free. It was designed by one of the top award winning coin designers in the WORLD. Each coin is individually numbered so you'll know exactly which coin is yours and what order you're in...the earlier you order the lower numbered coin you will receive! This is a pre-RV/rate change coin...by owning this coin you stamp you place in history. Time is short and supply is limited so act now if you want yours. Attention: Dinar Guru Community Members And Dinar investors…Deadline is 12 midnight Wednesday August 19, 2015. They All Laughed When I Told Them About The Dinar...But You Should Have Seen Their Faces When I Told Them It Actually RVed! Dinar Guru Insider will be delivered right to your mailbox. Personalized and dated "You Knew Back When" Award Certificate delivered to your door. You get this Pre-RV/rate change pure .999 1 oz. Silver coin NOW!! Ever feel as if your family and friends are laughing at you behind your back and maybe even making fun of you because of your idea about the dinar? Did you get into the dinar thinking it was a 100% guaranteed sure thing? You’re not naïve. You weren’t born yesterday. The dinar is an investment. …and that’s been battered and bruised by two major wars. You saw in Iraq what Donald Trump saw in what would become Trump Towers…a “fixer upper” with great “bones” and the potential to be GREAT again. They say how to get-rich-in-real-estate is to find the UGLIEST house on a block, buy it cheap and fix it up. They say it’s got the LEAST risk and MOST potential…the potential to pay off big! We’re talking about an abandoned dirt-cheap gigantic PALACE with gold and oil in the basement and with Kuwait, Jordan and Saudi Arabia as rich neighbors! Even war torn Syria has a currency worth more than Iraq’s! Obviously, you saw opportunity didn’t you? It could potentially make you a millionaire? Maybe even a multi-millionaire? …and because those millions could make you and your family FREE? …Free to live the lifestyle you always dreamed of providing without the endless pressure of making the mortgage and paying the bills? ---Freedom to live where you want and how you want? ---Freedom to sit back and enjoy your family and provide a life they are proud and grateful for? ---Freedom to help the people you know you can make a difference for. Yeah, that kind of FREE? Do you ever have doubts too? Doubts whether this whole dinar thing is REALLY real? Doubts that you don’t really know what’s going on? Doubts that you might miss out on what somebody else knows but you don’t? Do you every just want to know for CERTAIN you’re onto something BIG? Do you ever dream of going to your friends, family and coworkers who may have scoffed at your “dinar idea”, snickered behind your back and saying to them, “LOOK it FINALLY came through and I knew it would!”? Do you ever imagine for once in your life being able to say, “I told you so…you should have listened,” about something really really important? …can you really blame them for doubting you? This isn’t the first time you’ve ever had a “hair brained” idea that would get you rich is it? Have you every seen that look people give you when you’re sharing something you’re totally excited about but the other person just is not buying into it? They don’t “get it” and they give you that “look”. …the, “you poor little soul you” expression. Like they feel sorry for you or something. I really dislike that face. You’re trying to help THEM and they feel sorry for YOU??? It even hurts doesn’t it? And this is how they respond to you dreaming big AND trying to help them? You stand there feeling deflated. As you continue reading, I’m going to show you a way ANYONE can see your investment in a way that proves it’s more legitimate than it has ever been. That it has all the potential risks and rewards just like any other. Doubters in your life will not be able to deny it’s at least REAL. That it’s come of age. It’s time to take this investment out from the Internet shadows and bring it into the LIGHT of the real world! …to bring it to the next level! Hi, my name is Blanche Bonet. I was totally excited about the HUGE possibilities of owning a foreign currency but at the same time more than a little unsure and confused by how it all works, what’s really going on and who to believe. I even felt alone…as if I was on an isolated island with no one to really talk to. So many people around me couldn’t see what I saw. Was I crazy or something? I want to welcome you to this very unique and special opportunity I'm about to show you. Nine years ago, I literally hit rock bottom. I staggered through my DESTROYED home. I walked through a wasteland of filth and debris. The smell of rot, decay and mold was unbearable…even a commercial grade facemask couldn’t keep the stench out of my nose. I could even taste it in the back of my throat. Caked mud coated the buckled floor and oozed under my feet as I took each step. My sweet little house would never be the same. My kid’s memories, keepsakes and photos lay unrecognizable in clumps of grey mush piled by the street. No money, no job, no business, no neighbors and no community. I was an emotional wreck. I was drained. Unfortunately it seems everyone has these sad moments in their lives…rock bottom moments that feel unbearable. “JUST GET OUT!”, it was repeated by the mayor, the sheriff, the governor and the newscaster from TV all morning. Over and over, the message was clear…Get OUT! One day notice is all we got. Little tropical storm Katrina blew up into Mega Hurricane Katrina overnight. She covered the entire eastern gulf with winds over 165 miles per hour and was predicted to come right at us. Clearly, we were in serious danger. We packed the car with a few belongings, picked up my elderly mom and caravanned with two of my daughters and their families to Texas. We listened on the car radio as the news reports flooded in. We took a direct hit. They said the destruction was monumental. Flooding, tornados, fires, near riots…the entire gulf coast was beyond a mess. We watched the satellite radar over and over and over as the most dangerous and intense part of Katrina’s eye wall plowed directly over our area bringing a 26-foot storm surge and over 150 mph winds. Certainly there was nothing left…how could there be? My son-in-law was the first to return home to give a boots-on-the-ground eyewitness report. Traffic lights, street signs and flooded out cars everywhere. The roads were barely passable. The house was seriously damage and flooded but still there. Standing in muck sorting through our belongings was the worst. Choosing what to salvage and what to let go…it was too much. We persevered with the help of anonymous wonderful people from around the country and around the world. I’m eternally grateful for the warmth and caring that poured into the area. Without the help of caring individuals, all would have been lost. Although, my husband’s business didn’t survive. I’ve never got used to the phone ringing from all the bill collectors. 8am on the nose to 9pm on the nose…like clockwork—all day long. Lawn furniture that Katrina didn’t blow away became our living room set. We slowly got back on our feet. He said it was some sort of currency from another country that’s supposed to go WAY up in value. I had heard of Iraq from the wars but knew nothing about it other than that. But I just didn’t get it. I didn’t understand. Why would I want to buy worthless money from a country on the other side of the world especially when I had no money to spend here!?! I think I popped his bubble. He sort of dropped the idea and didn't bring it up again. Then out of the blue he starts up again…. He went on about how awful it would feel if we knew about this and didn’t act. He told me we didn’t need much to invest…which was good since we didn’t have ANYTHING to spare. We went to the “online boards” to learn more. Then I got excited too! I started to see what he saw…that before the war and Saddam, Iraq was a very wealthy country. That THEY were beat up right now by war and neglect…sort of like how WE were beat up too, but by Karina. Times were bad but they could be better again!! Really made sense to me. We scraped a little bit together and made our first purchase. And when it did, it was so exciting. The dinar was real…I could hold it in my hand. I could smell the distinct scent of Iraqi Dinars. The dinar became so much more than just people chatting online about it. We were holding this strange looking currency in our own hands. I got online and wanted to know everything I could about this dinar. This is before Dinar Guru of course…there were a few forum sites and rough and tumble chat rooms but NOTHING had any real organization. Everything was mixed up and confusing. I would go to this chat room and that dinar forum…I’d get on so and so’s conference call and then head over to a different website to try to piece the puzzle together. It was super exciting but there was no real substance. I started to ask questions in the chat room and people would get all upset with me for asking what they said were “stupid, dumb questions”. They would chastise me and tell me to go read that on my own…not to waste their time!?!? But where do I go to find this “Basic” information about the dinar when you’re new like I was? Is it real? Is it a scam? Am I hurting the people around me for telling them about it? Didn’t you have similar questions when you first started? If someone asked me about the dinar in the “real world” all I could do was send them to the dinar forums where people were as lost, confused and frustrated as I was. It was kind of embarrassing really. The real problem was the information was not in one central place for people to get to! I knew successful people invest in themselves and take action. So I decided to start keeping track of things myself. At first it was real simple. Who seemed to have a following of people and what they said. This was just for me and my husband back then of course. The thought didn’t even cross my mind really. Then my family found out about what I was doing. I didn’t want to get it wrong. Who was I? I’m no expert? They practically begged me for the information I compiled. They LOVED what I was doing! They said my Executive Assistant skills (I worked for years in the Mayor’s Office) were really paying off!! So I created a real system to make it easier. Then that’s when IT happened. My brilliant (and stubborn) son got the idea to build me a website so that others could more easily benefit from what I was doing. He said people all over the country could benefit from what I was putting together. Close friends and family is one thing…but to put myself out there in the world like that? To be laughed at and ridiculed for following this thing AND who would want this information anyway? He put the site up anyway and called it DinarGuru.com since he said I always was talking about the gurus. Before I could get him to take it down…people started coming. At first a handful…then a couple hundred…then a couple Thousand…then TENS OF THOUSANDS! My secretarial skills really did pay off! A real bright spot in those dark post Katrina days. I had purpose to help a lot of people. I was saving them so much time and frustration. I got better and better and the community grew and grew. The first thing people wanted was an organized way to follow the Gurus…and see what was said in the past. So we created the guru archive as the main focus of the site, which BTW is the oldest and most extensive in the world! Soon after that I coined the terms “Intel Guru and Newshound Guru” to clear up confusion and to distinguish Intel gurus who have personal contacts from Newshound Gurus who preferred their facts and documents in print. So we started collecting as many documents and facts as we could find. We put them in emails and sent them to the community so everyone would have them. Then people started personally asking me questions about the dinar! This report became the #1 member rated report I’ve ever created…you probably have this report too! …so we created the Start Here tab at the top of Dinar Guru so they could get caught up to speed as quickly as possible. The community wanted to easily see the big picture so we created the Dinar Guru Resource Bar on the home page. And we did a whole lot more. Now the Dinar Guru community is nearly 90,000 members strong and the site is visited millions and Millions and MILLIONS of times per month! You’d think everyone would recognize the GREAT thing we have here. There are websites and individuals out there that don’t want you to see what the gurus are revealing. These sites don’t want you to discover other's perspectives, other's findings, and they don’t want you to discover what’s possibly really going on. They want it all censored?? You can see them talking like this on the other sites. It’s almost like there’s a plot out there to trip us up…get us off the dinar trail or something. Are they trying to keep too many people from knowing too much? Are they trying to create just enough confusion to keep us guessing? Why would they not want us talking and sharing this stuff the best we can? You never know who’s watching the site these days. So if at times you feel lost, confused and not quite sure what to believe…it’s really not your fault at all. It’s certainly not just you. The Powers That Be…The political elite…the ULTRA wealthy old money types...or simply the jealous, who knows who may be pulling puppet strings. We probably don’t even want to know who’s behind it. There’s even talk in the community that once something MAJOR changes with the dinar…all the dinar sites will go down. They say, this is to disrupt you from being able to communicate with the dinar community?? Who knows if this is true or not…I don’t really think it’s possible. Our site has mysteriously gone down in the past but it’s always come back online. It’s a threat that can’t be totally ignored. As they say, just because we’re paranoid doesn’t mean they’re still not out to get us. …and then tell us exactly what to do next. It’s up to us…you and me. We’re probably not supposed to know much about the whole dinar secret at all! With a pocket full of dinar! They can try to throw you off the trail and discourage you but they can’t keep the information out of your hands completely. I started working harder than ever to get the information out to you. Over the past couple of years, I’ve sent over SIX MILLION emails to Dinar Guru members. That’s more than the population of a lot of CITIES! And we’ve reached numbers that are hard to ignore. We are no longer at the mercy of the PTB for information anymore. You are part of this savvy and awesome community! What I didn’t expect from all of this is now we have a NETWORK of seriously motivated members around the globe who desperately want information…and want to share it. AND are so ready and willing to share what they experience too!?! Now it’s time to take things to a whole NEW level! Besides, there are things we can’t talk about online since you never know who’s watching. The community has asked for it and we’ve reached the point in our Dinar journey where it’s the perfect time to do it. Times have changed with our "little" dinar experiment. The winds have shifted these past few months...you can feel it! The international community can feel it. And you can see it in Iraq. One of the gurus said it best this week...we've seen more done in the last few months than we've seen in 5 years combined! Change is here...the time is now. So because of all this we decided to create and LAUNCH the new Dinar Guru Insider! What do you think about getting a HARDCOPY, a hardcopy you can hold in your hands that I send you every month? This is the first and only PRINT newsletter devoted to pre and post RV that’s printed on REAL paper and delivered right to your home or business mailbox. This is your Dinar information lifeline…PRE and (especially important) POST RV information. This lifeline can’t be broken or controlled! There are eyes on the site so there are things we just can’t talk publicly about. This will give us a way to talk about these things. Besides, websites go down, email gets snagged in spam filters or lost in hyperspace and the Internet has glitches all the time but you can hold good ole physical mail in your hands! It's more critical than ever for you to have something like this in place so you don't have to worry. Creating the Dinar Guru Insider has been so much more challenging than I thought it would be…it’s been so difficult. A real pain in the…you know what! We’ve spent a bunch of money putting it all together…designers, printers, logistics of how it’s all going to work so you get it every month on time and in your hands. We had to think through everything…every step of the way. We spent 20-hour days researching, finding the best solutions at the lowest costs. But I did it for you guys. The first issue is just about done! Would you like me to send you a copy? The COOL thing is now that we have this all organized and put together it's now ready to get into your hands each and every month. It’s like a little newsletter making machine! My inner executive assistant wouldn’t have it any other way! Dinar Guru Insider is the epicenter and distilled information about the guru updates, member feedback, mainstream media and government documents and so much more. It also contains lifestyle insights that will help get the most out of our wealth and how to hold on to it! (They say most people who get a large sum of money lose it within a year or two…and sadly, ultimately they die broke. It’s printed on high quality, heavy stock paper and the colors pop off the page…it’s beautiful and something you’re going to be proud of getting. You’re not going to want to miss a single edition. Page 1: A personal message from me. This is where I’ll cover any pertinent “need to know information” about the dinar, the RV, Post RV info, Iraq drama, what’s going on with me and any random rumors that you need to know about etc. Sometimes there are things we can’t talk about publicly…they will go here. This will be your Iraq “investment at a glance” page. Here we’ll get into they ways experts make their money reproduce like little guppies in a fish tank, ways they invest it and have it WORKING for them 24/7. We’ll have something for novices who are just getting started and advanced information for seasoned investors who want to take it to the next level. You’ll get information specific to the dinar, ISX (Iraqi Stock Exchange) opportunities, other exotic currency plays, central bank information and the next big opportunity to keep an eye out for. This is going to be a very interesting section for sure. “Below the fold” Page 4: How to live the Lifestyles of the Rich and famous! This section will be a lot of fun. You have to live, right? May as well live large! Each month we’ll explore enviable places to call home and off the beaten path places to visit around the world. Places you probably don’t know about. From little hideaway seaside villages, to happening beach resort cities, to mountain towns, a whole new world will open to you. The truth is many of us are too busy to research and discover all that is out there that we would really love and enjoy...some of which is as close as our own backyards. We'll do that research for you and bring it right to you. There are a lot of things I want to see and do on my bucket list and this is going to be a FUN place to start!! “Below the Fold” Page 3: This is a fun little surprise you’ll have to wait to see when your Dinar Guru Insider arrives in your mailbox! This is all about living well and enjoying what you have. As they say, we’re not getting any younger and without our health what do we have? If you’ve been following me and Dinar Guru then you know I’m, ahem, no longer a spring chicken. Like my grandmother, I suffer from rheumatoid arthritis. I still remember playing on the floor next to her in her wheelchair. Now, I’m not in a wheel chair thank goodness but one of the main reasons I can still continue to keep Dinar Guru going is that I discovered I could influence my symptoms with FOOD and lifestyle! I learned this directly from Dinar Guru members like you who have shared what they know (have I mentioned how awesome you guys are lately?! :). This section is all about holistic health and aging gracefully. The Special Ride-Along: The magic pipeline directly to YOUR mailbox! Being connected through the Dinar Guru Insider every month means I can EASILY get you MORE stuff! You never know who’s watching and listening…there are times I want to talk to you in a different format to keep it between us. The pipeline is in place…all I have to do is add something extra to ride along with the package! You’re already getting the newsletter so it’s that much easier to get you something special in the mail. Your first month ride along IS special! I’m going to tell you all about it in just one second so sit back and keep reading. The key here is that now that we’re connected by a DIRECT link it can’t be cut off! You will always get the information. The Internet fails…emails get lost…websites don’t load but physical mail is nearly always delivered. Do you see how this whole dinar investment is maturing? Becoming something you can touch and feel. We are a real community now. The Dinar Guru Insider is something you can point to when someone gives you grief about your investment! Something without substance and merit can’t pull off a massive undertaking like this…It would be impossible without a strong committed savvy community. It can’t be ignored or dismissed. This is super exciting and I’m excited for you for being there right at the beginning! I showed the Dinar Guru Insider idea to a small group of VERY CRITICAL (and not shy about expressing their opinions) dinar owners and they absolutely LOVED IT! They couldn’t believe what all I included (more on this in a moment!). 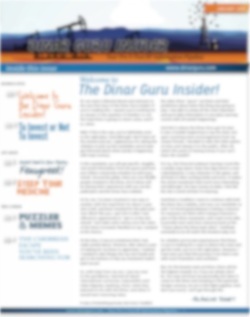 I want to give you an opportunity to get your very own copy of the Dinar Guru Insider every month…it’s awesome. I want to give you even more goodies too! I want you to have something tangible you can be super proud of. This has been a long journey for me and I’m sure for you too. They of course will be jumping on when it’s a sure thing…when there is no risk…when they didn’t need foresight and vision to see what was going to happen. You believed when NO ONE else did. You believed when people scoffed and laughed at the idea. You believed when others thought it was impossible. You hung in there and saw through all the chaos that is Iraq. You put in the research. You pulled the pieces together and took the early risk. You invested your money into the people of Iraq and helped make it the country it is today...what this opportunity is today! 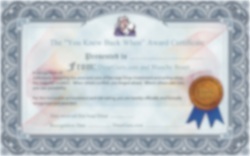 I want to send you as a bonus for getting the Dinar Guru Insider...the “You Knew Back When" Award Certificate! This beautiful certificate is printed on 100% pure white high quality paper. Your award will be personalized with your name written by hand and officially dated and sealed. Everyone you want to know will know you knew back when no body else believed! This is something you can hang on your wall, frame on your desk or keep in a special spot just for you. Long after your dinar are exchanged or in the bank, you’ll have DOCUMENTED proof of what you’ve been through and what you believed when no one else could. "When others scoffed, you forged ahead. Where others saw ruin, you saw possibility." Life is full of moments when you absolutely KNEW something was going to happen and it DID HAPPEN!! But you didn’t have anything to PROVE without a doubt you knew. And people didn’t say it, but you could tell by the look in their eye, they didn’t completely believe you. You’ll have this professional designed full color certificate to keep forever. Your certificate will be delivered with your first issue of Dinar Guru Insider. This is something every dinar investor needs and is highly requested from members. Members have paid as much as $47 to gain access to this report but I want to include it with your subscription. You’ll get instant access to this downloadable report. You can read it today. 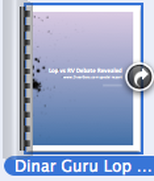 Goodie Bonus #3: "The Dinar Gurus LOP talk Special Report"
This special report has been downloaded by THOUSANDS of dinar guru members. Inside this report you’ll learn the ins and outs of what the community calls the LOP or what Iraq calls “drop the zeros” or even remove the zeros. This is a highly controversial topic every serious dinar holder should be informed about. You’ll get instant access to this report today too. To gain access to this report it normally costs $47.00. I want to give it to you for FREE. Goodie Bonus #4: Post RV: Insiders Cheat Sheet to Getting The Most (and Avoiding the Worst) of Your Dinar Exchange. Now it's getting absolutely AWESOME! You’re going to love this one. Obviously, since the dinar has not revalued or changed in value, it's not written…YET! But when the dinar RV’s or dramatically changes in value it's imperative to be in the know...the good, the bad and the ugly surrounding dinar exchange. …and maybe more importantly, what to AVOID so you don’t lose your pants. Naturally, nothing has changed with the dinar rate so I don't know what's going to happen. You’re part of the largest dinar community in the world…nearly 90,000 members scattered over the globe. The Post RV Cheat Sheet will be made up of the REAL WORLD experience from your fellow community members. If this includes 800 numbers to use, you’ll get them. If it includes 800 numbers to AVOID like the plague because they will hurt you and your family, you’ll get that too. This will be your guide of how to keep you and your family safe during this critical time. To compile this report is going to take a ton of effort. To pull it together quickly and get it out the door fast … it alone will have to be offered for around $497…that’s if I even offer it to non-Dinar Guru Insider subscribers at all. 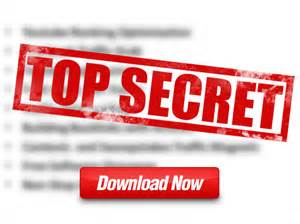 Dinar Guru Insider members are the elite of the elite after all so I want to include this FREE with your subscription…active members will pay nothing for this report. You'll have the peace of mind knowing you have a Post RV cheat sheet with your name on it that will be sent directly to you mailbox regardless of what's happening with the website. You already have your personalized pre-RV Award Certificate bonus, proving you knew about the dinar BEFORE it RVed, right? Shouldn’t there be something special for this monumental event? I think there should be something super, Super SUPER special! Something unique to commemorate the event! Something you can pass down through the generations. Something that truly documents what happened to you and your family. We came up with something special. This is going to be totally awesome. We are commissioning a one of a kind MINTED gold and silver coin that will commemorate this event! This is being designed and minted by one of the largest mints in the United States. 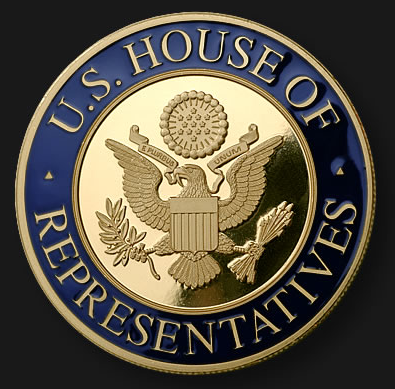 Your coin will come from the same mint the US Congress uses for their special coinage! 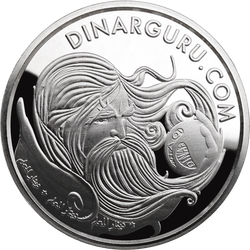 As an active Dinar Guru Insider subscriber you’ll have one of the first opportunities to get your hands on one of these very limited edition collectors items. They’ll hear about the Iraq war and the ultimate sacrifice men and women made and the fight for democracy and how your investment in Iraq helped pave the way for millions and millions of people in a foreign country to be free and without the fear of a horrible dictatorship. They’ll see the huge rewards both countries realized and they’ll hold a piece of that history in their hand. All because of what you are doing now. Obviously I’m not going to charge you this but let me ask you a question. What if all this did was give you peace and confidence in your dinar holdings? What would that be worth to you? What if all this did was to give you the ability to make one better-informed decision pre-RV? Would it be worth it? Would it be worth having documented PROOF in hand that you knew what was going to happen BEFORE the dinar changed in value so you can always point to it and show anyone who questioned you? Would it be worth it to be able to say, “They all laughed when I told them about the Dinar but you should have seen their faces when it actually RVed!”? Would it be worth it if you avoided just ONE huge potential pitfall post-rv that could cost you thousands and thousands of dollars? Would it be worth it if you got a tip that potentially could lead to you getting a little better exchange rate than everyone else? $1,000 is not the actual price, as you know. This community means so much to me and my family…I actually enjoy and love working hard for you. Even at $97 I know you may still be a little nervous. So here’s the thing I like to do with everything I offer. Try it out…get the first issue, get the certificate, get the other goodies and I 100% guarantee if you are not happy with your subscription you can ask for a refund and I’ll give it to you no questions asked. My son thinks I’m a total nut-ball for offering this guarantee since there is so much hard cost involved in printing, packaging, handling, postage, shipping and all the effort that goes into putting the content together…but you and this community are that important to me. I stand behind everything I do. If you’re not happy, let me know, I’ll refund your money right away and you can keep the Issue you have, the frame-able “I Knew When Certificate” and the 2 special reports…we’ll part as friends. This isn’t for everyone…so I do ask if you know this is not for you, please do not subscribe. You know, there are some people that don’t believe that they’re going to get the rewards they want even if they take action and work for it. Of course, there are some people that believe that the government will take complete care of them too. If you’re NOT serious about your dinar holdings…this is NOT for you. If you feel the dinar is a scam…this is NOT for you. If you feel the banks and the dealers have your best interest at heart…this is not for you. This is not for you if you do not feel the Iraqi dinar is an acceptable investment risk for you. And quite frankly, this is not for you if this is going to take food off of your table or cause you tremendous financial hardship. We don’t want you to get it…continue to enjoy the free information on the site. This is for members who feel the dinar is an extraordinary opportunity yet at the same time understand the risks. …and you want to be part of a community of elite dinar holders from around the globe and gain all the benefits thereof then this IS for you! I say all this because this is NOT going to be available forever. In fact it’s only open for a few days before I have to stop taking subscriptions. I have hard deadlines to meet. This has to be finalized VERY soon so that I can print, package and get it out the door so you can get it in a couple weeks. Also, I must keep this to a very limited number. We just don’t have the capacity to send this package to 90,000 Dinar Guru members. All 90,000 members WILL get the opportunity to get on board so I’m pretty sure all the slots will be taken…FAST. To be fair, it’s first come first serve basis. Since you are one of our special 90,000 dinar guru members, I’m letting you know first, but in the next few hours I’ll release it to the overall community at large worldwide. If you want it, you have to get it now. When they’re gone they’re gone. I'm telling you this, because I want you to have it. I know you'll enjoy it and get a lot out of it. Also, I can’t keep it at this low Launch price special for long…this is the last time you will see this low price. This is the pre-launch price...after the launch the price will go up to the normal price. Once the dinar RV’s or raises significantly in value, there’s a good chance I will not be offering this anymore at all. And you might be locked out. So go ahead and click the link below before this opportunity is gone. You’ll see your “I Knew When Certificate” with your name hand written in big letters…you’ll see the FIRST ever edition of Dinar Guru Insider. How great is that going to feel to finally have something tangible in your hands…. Being part of something REAL. Do you think you’ll feel that much more certain about where you stand? Click here now to order and claim your spot. Tomorrow you know you’ll feel good knowing for certain you will not feel lost or left behind. If you clicked and started the order process let me tell you what to expect now. The first thing you’re going to get is the download page with all your special reports listed. 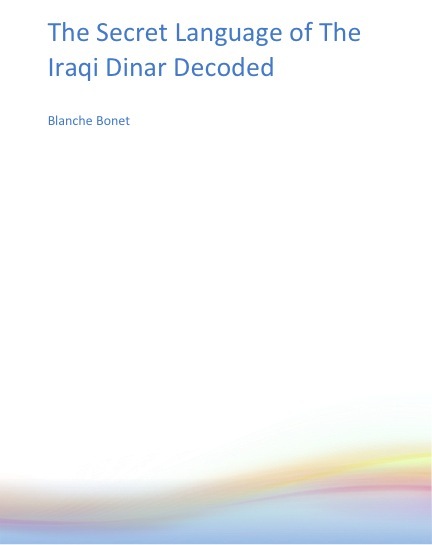 You’ll see the Secret Language of Dinar Special Report. You’ll get the “decoder ring” of all the 3 letter terms the gurus use. Then you’ll see the Lop Talk Special Report. You’ll discover what all this “drop the zeros” talk means and what it means to you and your dinar holdings. You’ll even see what your Certificate is going to look like when it arrives in the mail. You can expect to get your first Issue of Dinar Guru Insider along with your personalized award certificate in the mail early next month. …remember this is not about me, this is not about someone down the street from you…this is all about YOU. It’s available to you now, so if you want to be part of this unique opportunity...get it. Go ahead and click this button now and I’ll see you on the next page. Oh, btw, this makes a fantastic stocking stuffer too! So feel free to get this as a gift for your spouse, kids or dear friends. I'm off to finish up the last touches on the inaugural edition...see you in your mailbox! PS Remember you're getting the monthly Dinar Guru Insider PLUS the .999 pure sliver Premier Elite Investor Coin, the "You Knew Back When" Award Certificate, The Secret Language of the Dinar Decoded Special Report, The LOP vs RV Special Report...and once the dinar makes a significant rate change you'll get the Post RV/Rate Change Cheat Sheet and preferred access to the special limited edition Post RV Minted Coin too all for only $97 every 3 months! This is 100% guaranteed too...if you're not happy I'll refund your money right away no questions asked and you keep everything. Click below to get started now. No thanks Blanche, I want to revoke this and downgrade my membership…I understand my Dinar Guru Insider Membership spot and silver coin will be given to someone else.